The last picnic table we had cost $10. We had just moved into our first house, while I was at the township office working on paperwork, I saw a pile of picnic tables outside. They happened to be old tables from the parks in our township, and they were selling them cheap to make room for brand new tables. I dug through the stack and chose the best of the bunch, and after refinishing it several times over the years, it lasted us until we made this last move. I had plans to make another one this spring, and then my cute hubby surprised me by making one when I was out-of-town a couple months ago. We’ve always used our picnic table a lot, and with the good weather finally making an appearance here in upstate NY, I was very happy! I had to wait about 6 weeks for the pretreated lumber to finally dry out in order to finish it, but it’s finally done, and I love love it! 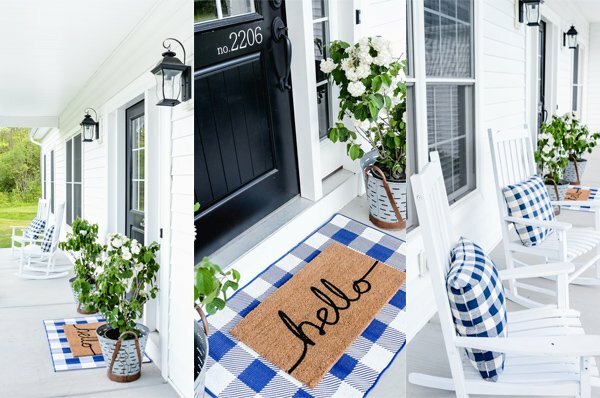 I’m a farmhouse kind of girl, and since I love the look of painted white with a stained top, I decided that it would be super cute on this picnic table. And it is! I love my farmhouse style picnic table! I also added numbers 1-8 on the benches–I love how they look, and I also use them for practical purposes. Just call me Captain Von Trapp, but my kids each have an assigned number. It goes on their bar stool, shoe basket, coat hook, towel hook, and anything else that will help keep us organized. When it comes to their kitchen chairs, it eliminates arguing about where everyone sits, and the picnic table fits in that category. And did I mention it was cute? First of all, I’m sorry I don’t have any plans that show how it was made. My husband and I work a lot together when we build, and I’m always the photographer. Since he did this as a lovely surprise, I have no photos for a tutorial. However, there are lot of plans online that will work well. -We used treated lumber so it would hold up in the outdoor weather better. Treated wood is usually kind of wet when you buy it, and you need to wait about 4-6 weeks to paint/stain, so it can fully dry. -I stained the top with Dark Walnut by Minwax. It’s my favorite stain! If you know plan to leave small spaces in between the boards on the top, you may want to consider staining before you put the table together. You can always do a second coat after it’s done to touch up. It can be tricky to stain in between the boards after it’s built, depending on how wide the spaces are. If you do that, and use treated lumber, you’ll need to wait before building your table. You have another option–and that’s to build your table, let it dry the allotted time, then stain the top. This is what I did, and the spaces of my boards were wide enough that I could place a lint-free rag over a butter knife, dip it in stain, and slide it between the boards to stain in between them. Worked like a charm! -I painted the bottom with an out-of-the-can flat white off the shelf at Home Depot. It’s inexpensive, and works well for outdoor projects. I needed two coats for the coverage I was looking for–more of a distressed look. You can always add another coat if you want it more solid white. -I did a little distressing on the ends and edges of the stained boards, and as well as the white benches. Not a ton–the weather will do that naturally over time–but enough to give it that lovely weathered look. -I cut numbers out on my Silhouette Cameo vinyl cutter , then used the negative space as a stencil. I painted the numbers with Rustoleum flat black spray paint . I just sprayed the paint into a paper bowl (don’t use foam, it will dissolve it! ), and used a foam brush to apply it. I like it for outdoor projects to much better than craft paint-it’s much more durable for outdoor use. -The last step is to seal it with Thompson’s Waterseal. Even though I used treated lumber, I like having this last step as an extra protectant. I absolutely love how it turned out, and it will be perfect for all of our summer meals and entertaining! Did you put the Thompson water seal on just stained table top? I didn’t think you could put Thompson on regular paint? Just curious. I am making these for my wedding. They are beautiful! Thanks for sharing . How long did you wait in between staining and sealing it with Thompson? I let the stain dry at least 24 hours–sometimes a little longer, depending on the weather and humidity. Just a note–it’s not really recommended for stained surfaces. :) I do it anyway, and it’s always been fine for me, but I just wanted to make sure you knew before going ahead with it! !